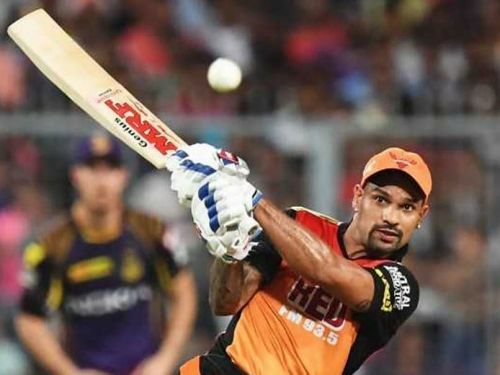 'Gabbar,' as Shikhar Dhawan is popularly known, has a brilliant record both in the Indian Premier League as well as in international cricket. He is 13th on the list of India's highest all-time run-getters in ODIs with 5178 runs in 123 matches at an average of 45.an 03 and an exceptional strike rate of 93.48. The Delhi-born player has a decent record in T20Is too. Dhawan is India's 5th highest run-getter in the shortest format of the game and has amassed 1296 runs in 49 T20Is at an average of 28.8 and a strike rate of 132.24. The 33-year-old has been a mainstay in the national team, at least in the limited-overs format. The southpaw has not been in the best of form lately as he amassed only 64 runs in the 3 T20Is against New Zealand and put together just 47 runs in the last 3 ODIs against The Black Caps in the recently-concluded tour. Considering the kind of temperament he possesses, Gabbar is sure to bounce back. However, Dhawan's significance as an opener in the side is there for all to see. The naturally attacking batsman has a brilliant IPL record. Overall, the flamboyant strokemaker amassed 4058 runs in 143 matches in the IPL at an average of 33.26 and strike rate of 123.53. This makes him the 6th highest run-getter in the history of the tournament with Raina, Kohli, Rohit Sharma, Gambhir, and Uthappa above him in the list. He will be an indispensable asset for the Delhi Capitals in the upcoming IPL. In this article, we take a look at the Top 3 knocks played by Gabbar in IPL history. The Sunrisers Hyderabad were squaring off against the Mumbai Indians in what was the 37th match of the 2011 IPL. Mumbai Indians won the toss and chose to field. David Warner and Shikhar Dhawan came out to the middle to begin proceedings for the Hyderabad-based franchise. The openers gave the team a solid start and Warner made 48 off 33 deliveries. It was Dhawan, however, who stole the show for his unbeaten 82 off 57. The Delhi-born player batted right through the innings and hit 10 fours and 1 six in his knock. The reason why it was such a special inning was because it was well-calculated. Dhawan let Warner take the risk when he was at the crease. However, he took it upon himself to keep the scoreboard ticking when Warner departed. The 33-year-old even smashed Bumrah for 3 fours in a single over and unsettled him. Yuvraj also hit a quickfire 39 off 23 deliveries to help the Sunrisers set up a competitive total of 177 in their quota of 20 overs. In response, Mumbai Indians were bowled out for just 92 runs in 16.3 overs and the Sunrisers won the match emphatically by 85 runs. The opener finished the 2016 IPL season with 501 runs in 17 matches at an average of 38.53. Dhawan will be the go-to man for Delhi in the upcoming edition of IPL. IPL 2019: Will Shikhar Dhawan roar for Delhi Daredevils?